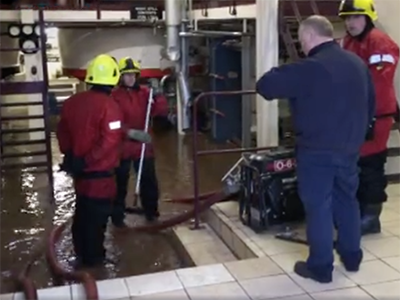 January 7, 2016 – While most Scotch Whisky distillers have been lucky to avoid major problems from flooding caused by more than two weeks of heavy rain, Angus Dundee-0wned Glencadam Distillery is facing extensive cleanup and repair work after its still house was flooded today. “At the moment, we’ve got four pumps working, we’ve got four crews of emergency firefighters working…we have roughly two to three feet in the still house of water probably coming in through the drains of the boiler house,” distillery manager Douglas Fitchett told WhiskyCast in a telephone interview, describing it as “an inundation.” Fitchett says the farms around the distillery and a nearby reservoir have flooded, and all of that water flows toward the distillery. “Unfortunately, we have a main drain which has been placed on our system by the local council several years ago which is a ten-inch pipe, and which is running full…so that doesn’t help,” he said. Fitchett says none of Glencadam’s maturing whisky stocks have been affected by the flooding, though there is extensive damage to the distillery’s electrical system that will take time to repair. The last flood at the distillery was in 2007 when the outlet pipe that supplies water from the nearby burn collapsed, and required several days of repairs before the distillery could resume production.